"My digestive system improved a lot in the last 4 months use of Tahitian Noni® Juice. My body is absorbing more nutrients at the cellular level now. At the age of 60, I feel very energetic and have improved mental clarity." Did you know that... Over 100 million bottles sold of Tahitian Noni® Juice. "I have had many health concerns and tried other generic Noni juice from the stores. But none of them worked. My friend Stacey introduced Tahitian Noni® Juice to me. I started it with little hope but I would like to say that I am very impressed with the results. Now after 2 months of use, I have more energy and feel lighter and better. 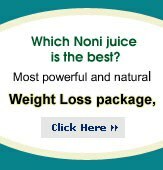 Please post this email on your web site http://www.Nonijuice.us, I hope other people will read this and see that it DOES work! The compliments I receive and the happiness I feel inside now radiate to the outside." Tahitian Noni® Juice works on a cellular level and can support multiple systems of the body. 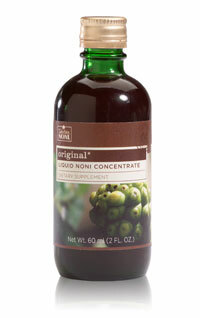 Noni Concentrate - Original is an easy and effective way to receive the benefits of Noni. The new two-ounce bottle size is highly concentrated and convenient enough to store anywhere. It is one of the most versatile and effective ways to get Noni into your system. FAITHFUL Noni USERS UNTIL THE END! "I have been consistently taking Noni Concentrate for almost 2 years now, and to tell you the truth I can't live a day without it! I've tried the juice as well, and though it was good, I've never experienced results with any other natural product like I did with Noni Original Concentrate! I had so many health issues in the past but touch wood, I haven't even had a cold in the last two years! My husband and I both will be faithful Noni Concentrate users until the end! Thank you so much for producing a wonderful product like "Tahitian Noni® Original™ Concentrate". Helps maintain a healthy body Buy Noni Concentrate Now! The Noni plant is very versatile. The fruit and leaves are known to have many traditional uses. When we talk about Noni, we break it into three key areas of product development: the fruit, leaf and seed. Fruit – We use a fruit puree in the juice beverage, as well as Noni extracts in other products. The fruit in concentrate form becomes an extract that is used in other products including facial care and skin care. Leaf – Used as a tea the leaf has great antioxidant benefits, in addition it aids the digestive system. The leaf also can be processed into an extract that we call Noni leaf serum which is a soothing gel used for topical applications. Seed – Tahitian Noni International has received a patent for the process of extracting the oil from the Noni seeds which is used as a moisturizer for our facial care products. We also sell the seed oil as a separate product, which features linoleic acid which has been proven to be a powerful ally in skin hydration and health. What is Tahitian Noni® Juice? In the early 1990s, food scientist John Wadsworth was introduced to Noni, a fruit high in antioxidants and rich in a history of helping people. He later traveled to Tahiti and other islands in French Polynesia to further his research and determine the availability of the fruit for commerce throughout the rest of the world. Tahitian Noni International was the first company to bring the health benefits of the Noni plant to the world outside of Tahiti. John partnered with Stephen Story, both food scientists, and spent two years formulating Tahitian Noni® Juice. Does Tahitian Noni® Juice contain added sugars? All natural juices have natural fructose which is a sugar. We do not add any additional sugars to the juice. How is Noni fruit harvested? The fruit is hand picked as it ripens. Because of the favorable climate of the South Pacific, the Noni tree bears fruit year round. Tahitian Noni International has specific guidelines about the size and ripeness of the fruit, and those that harvest the fruit must first be certified by Tahitian Noni International. How does Noni cure cancer, asthma and arthritis? Noni is a natural healthy beverage rich in antioxidants that promote wellness. TNI and its Independent Product Consultants do not claim that Noni cures cancer or any other ailments. TNI has strict guidelines on how its products can be presented and described, and we absolutely prohibit any misrepresentation of the product. How is Tahitian Noni International different from other companies selling Noni? Tahitian Noni International was the first to introduce the benefits of Noni to the world. Tahitian Noni International has the largest Noni research facility and is dedicated to pioneering new, innovative applications for the Noni plant. Tahitian Noni International has patents issued and patents pending relating to the Noni plant. We sell only the original authentic Tahitian Noni® Juice manufactured by Tahitian Noni International, no other Noni product can compare in terms of quality, taste and benefit. Millions all over the world are using Tahitian Noni® Juice to support their bodily systems and to increase their mental clarity and physical performance levels. Try it Risk Free. Read more about Moea hair care, TePoemä® facial care, skin care, Tahiti Trim Plan 40 weight loss products.